WHY IS T.I. SO TOXIC?! He Tried To Manipulate Tiny Into Believing She's Not Mad About His 'Marital Indiscretions'. Come Again? T.I. makes it SO hard to like him. On one hand, he's seemingly down for the cause, speaking out against racial injustice, and doing his part to bring awareness to the issues we all run into in the black community. But in true hotep form, he goes turns into a total jacka** when it comes to being a good husband to his wife, Tiny Harris. It's no secret Tip has cheated, embarrassing his wife and mother of his children on a larger scale now that his antics can be blasted all over the Internet. Yet, he continues to do it. At one point, Tiny got fed up and filed for divorce from the Atlanta rapper in December 2016. The divorce has since been called off (shocker!) and the two have been "working on things." 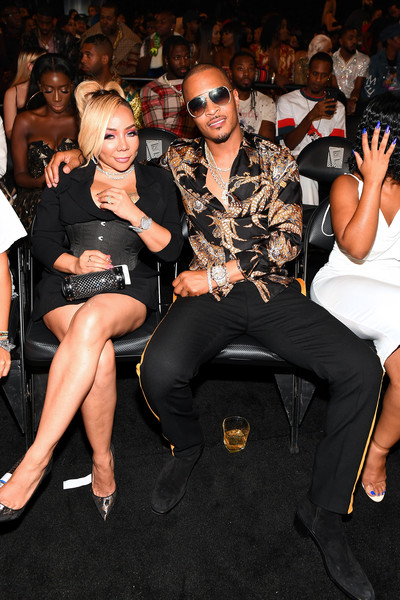 On the premiere episode of "Friends & Family Hustle," Tiny confronts Tip about an incriminating video that made its way to social media. It shows him grabbing/smacking "Greenleaf" actress Asia’h Epperson's cakes backstage at one of his concerts a few months ago. Instead of taking ownership of his transgression, he flipped the script. He TOLD Tiny (not suggested or asked or alluded to) the REAL issue she's mad about is that the video was posted to social media, not what he was doing in the video. Wait...what? He said had the video been sent to Tiny directly, it wouldn't have even been a problem. Oh? He went on to say that he hates how everyone else's opinions get in their house and in her head. We bet he doesn't hate those reality show checks where he invites the world INTO his home. He tried to make her believe she was only mad because people were hitting her up about the video. Umm, no sir. If you weren't out here THOTTING then no one would be hitting her up in the first place. The Dime Trap rapper wasn't finished there. He fixed his mouth to tell Tiny that their chemistry can't be duplicated and she'll never find any man as good as him. The narcissism is nauseating. Tiny very likely believing this ish is even more gross. Tip linked up with his homies Lil Duval and K Dub to chat about the situation over drinks. "What kind of man records another man through the crack of the door, who ain't even really doing sh*t?," Tip asked. "Like, ain't no man code no more. I was NOT caught cheating. The point we speak of, I was caught flirting." "How you keep getting caught up man?," Lil Duval asked. "You can do something and it will not make it. If I go somewhere and do half of what you do...," T.I. explained before he was interuppted by Duval. "Well, you should know not to do half of what I do!," Duval said, basing up on Tip. Maybe TI & Tiny have an arrangement. Maybe they've agreed slapping cakes and outright flirtations aren't cheating. Something tells us neither is the case though. Who would have thought comedian Lil Duval would be the one to offer up sound advice? We're happy he does have some people around him who can give him the REAL because Tip is wildin' out in these streets. We also noticed the "Greenleaf" actress in the video getting groped by T.I. was seemingly firing off subliminals after the premiere episode of the show. Asia'h hopped on Twitter insinuating that this is all just another "storyline" for the couple. Damn...anyone else need a story line?! The next episode of "Friends & Family Hustle" premieres next Monday at 9/8c on VH1. In case you missed, peep pics of T.I. and Tiny making their LA rounds HERE.